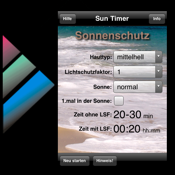 The Suntimer helps you calculating the time, that you can lay in the sun without harm. Thereby these statements are only indications. - Result: Time in minutes and hh:mm with and without Sun Protection creme.